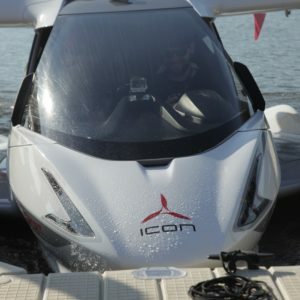 Icon A5, an almost affordable personal plane. $189,000 basically gets you a flying sports car. [dropcap]A[/dropcap]s we cut through the skies over the Hudson River and traced a loop around the Statue of Liberty, I spent as much time glancing down at the instrument cluster as I did peering out the window. That might seem like a huge waste of time given the views I was taking in but I couldn’t help it: It’s not often I wind up in the cockpit of a plane looking at dials and readouts, much less ones that make sense to me. 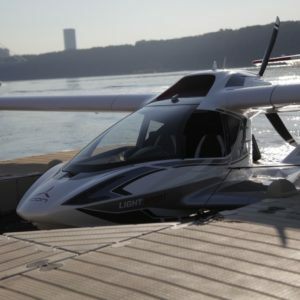 That’s because a pilot and I were tooling around in an Icon A5, a $189,000 “light sport” aircraft that’s eager to shrug off the complexity of (relatively) cheap aviation. 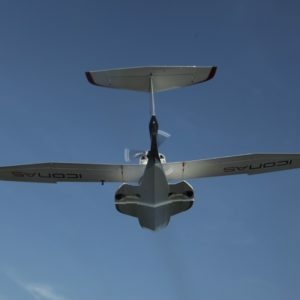 After nearly ten years of development and fighting for FAA approval, the A5 is almost ready to make the skies accessible to the well-heeled. In a way, the Icon feels like the iPod of personal planes: It’s small, stylish and surprisingly intuitive. 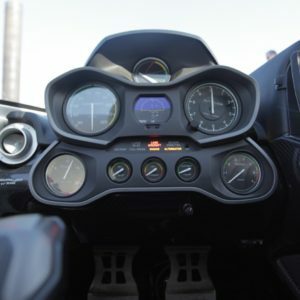 The instrument cluster I mentioned before is comprised of eight easy-to-read dials (plus a digital attitude indicator), set in an aggressive-looking plastic chassis that just screams “sports car.” The shiny Icon badge stuck in the dash in front of the passenger seat keeps that visual metaphor alive. Toss in a tablet for navigation and the skies are yours. The seats are comfortable, if a little low. Cargo room? You’re not exactly flush with it, but there’s room behind directly behind the seats for an overnight bag and some sundries. And it’s a looker too, with two folding wings lock in place over a sleek, white-and-silver cabin and a dagger-like tail jutting out from below the seats. Well, fine, not everyone. Those iPod parallels run deeper than style considerations; the Icon isn’t nearly as cheap as some of the other beginner’s options out there. Amateur pilots often earn their first set of wings behind the stick of a single-engine Cessna or Piper, and well-worn classics like a Cessna 152 built thirty years ago can go for between $20,000 and $50,000 on the open market. Almost reasonable. 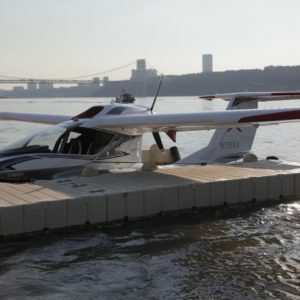 More modern options like the Evektor Harmony, another handsome light sport craft, will probably set you back around $150,000 in good nick. 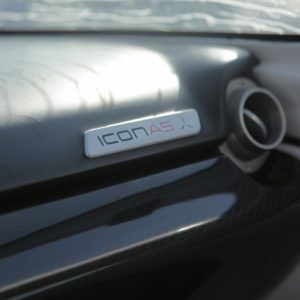 Then there’s the Icon with all its bells and whistles, sitting at the top of the beginner’s heap, at $189,000. For now, anyway. Hawkins says the team is committed to quicker updates than other plane makers, so it’s possible future models could cost less as the company figures out more effective means of production.